When I went to Church on New Years eve and the Pastor announced 100 days of fasting (RCCG) I almost somersaulted from my seat! I was not alone...suddenly the auditorium was filled with "ahs', yeeeehh"... and lots of murmuring like bees swarming honey. Who send me come Church today? I know some people there were wishing they are members of other churches, I know...I know because my mind stroll reach that side. However, the fast is all for our good, it is a destiny changing kind of fast and I am determined oh. ! I have to be honest with you people, I have been trying, struggling on some days and that is exactly what I want to gist you. It easy to fast on weekdays when I'm going to work and will be distracted from my hunger for most of the day...me that I have puff-puff lover, plus that mama Bisi rice I always buy downstairs, plus chin-chin on third mainland bridge...now I see food and turn away. O ma se o. One Saturday...when hunger wired me! I started seeing vision... by 12:00 I was already looking at the clock...I even started planning the big pot of rice I go use break. So I started cooking, I cooked the jollof rice by 1:00pm, the tin done quick that day. So I went passed some time by watching AFMAG...I find Sanyeri and Odunlade funny most days but that day it was just irritating to watch. My temper sef was short. Ok, 3:00 pm nack, I decided to fry the chicken for the jollof...ha ha ha...all this I did without "tasting" the food. Chicken fried, I looked at the time... 3:45.... ahn ahn...lataaaaro! The devil is a liar! I went to the room and forced myself to sleep, the worms in my belly woke me up by 5:15...halleluyah! Almost food time, so I cheerily hopped to the kitchen to fry the dodo for the rice and chicken, after frying, the time was about 5:35, hmmmm....Ok, I decided to put the food inside plate, I arranged it neatly, I put spoon, I set the table, I put a glass of water, and a pack of juice. All these things I was doing and it was still 5:45....ahn ahn! Maybe this clock in the living room is bad. In my wisdom I went round the house and decided I would go with the clock that was earliest, in fact, it's already 6:00 pm in UK, I reasoned to myself... the plate of jollof rice was calling my name, singing lullaby's...my body was already vibrating like leaf wey rain beat. I planted myself on the dining table...staring at the food, looking at the clock. Food. Clock. Food. Clock.Time crawled... As soon as the big hand reach 12...see diving na, see rushing - I was eating like someone that has been starved for 10 days! Do not attempt to YIMU at me because I know I am not the only only that acts like that when hungry - Hunger can change everything you thought you knew about yourself. Fasting is difficult but the rewards are enormous, spiritually, mentally, emotionally, physically! Hahaha. Your sincerity is both hilarious and heartwarming. The rewards are definitely worth the temporary inconvenience. Pele, God is your strength. HILARIOUS! Buahahahahahahahahahahahahahaha Sisi Yemmie haf killed me! Do you know that ... This your story can make a short movie! Insightful! Whoever decides to make the movie should call me to act it!!! Interest....pls sisi dnt turn ur fasting to hunger strike ooo. LOOL! Your honesty is refreshing.. God's grace for the 100days oh! Our destiny must be GREAT! This post reminds me of the posts i used to read back then on your blog. I would roll and laugh and leave my sisters wondering if i had gone mad. Lol...in all this your "food-time watching" I sincerely hope you didn't forget to pray sha? Sis yemie no be only u o,mehn me relocate to 3pm jeje,i respect myself + make I no fool myself.serzli weekend fast is war.weekdays I cope fine.i no dey tink am sef bcos 100thday far from today o.
can't stop laughing, You are just so real..........God's grace for the remaining fasting days. LOL...Omo, 100 days out of 365 days? Me still dey struggle with my 30 days sef. I want hustle pastor make im go back to God to negotiate for 1 week...lol. I agree that you can definitely make this into some short clip. Kinda like what NdaniTV does. Love with style of writing. Kudos! Sis Yemi, this is so funny. 100 days = no joke! LOL SisiYemmie, I can relate. I find that it gets better though. Days 1 and 2 were the hardest! I had hunger induced ANGER! Praying makes me feel like the clock is ticking faster, and even distracts me from my belly. Lol sisi yemmie always up to something funny..
Sisi yemmie u dey pray b4 u break so? Sisi are you not supposed to pray before breaking the fast? The Lord will continue to give you and everyone the strength and grace to do the fast WELL. I put well there because you don't want to be on hunger strike. -one thing I always endeavour to do is always ask God (in prayers) that if there is anything that could cause my fast not to be acceptable he should reveal to me. Because sincerely think about it, you kneel down to pray on day 50 and God reveals to you that all the fast (last 50 days) you have done was not acceptable can you imagine (I think I will pull my hair out). You might as well have eaten the last few days rather than starve for nothing. Always ask God everyday to show you. Sisi Yemmie.... you have killed me... I laughed soooooo much I ran to d bathroom almost peeing on myself. Girl, pastor Adeboye is doing allllllll of us bad thing. I woke up this morning feeling very faint, light headed and......... just hungry abeg. Fast ended at 12noon today abeg. 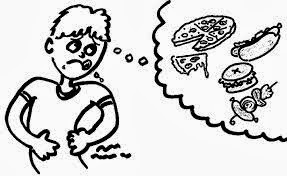 Typically when u start thinking of food dat much? U should just eat 'cos focus don shift at that point. ....but gal, u made me laughhhh.... made my DAY. Sisi Yemi, u didn't pray? Lol. Lwkmooo..mine is mfm 3days dry fast..I'm already crying b4 d fasting which is going to take place morrow..hmmm na to just dey ask God4 strenght no ni ooo.100days no b moi moi oo..
Hahahaha you are not alone! Lmao... That happened to me the other day... But of course I prayed before eating. Quickest praise and worship of my life lol. It gets easier after the first week. But it's all for breakthrough and a closer communion with God. I didn't hear this addendum. Lol, it happens to me as well, the time moves slowly on days the fast gets to me... i close my eyes to pray and after the longgggg prayer i see it's only 5mins gone! It may be tough, but when you're enjoying the miracles attached to it, you'll forget the torture!!! Wish you strength for the rest of the days. nice to know that u are participating in the fast. God alone is our strength. 2014 will be a graceful and wonderful year for us all. Chai! So you didn't pray before diving into the plate of rice? I can imagine how you were shaking like a leaf! Too funny! The Lord is your strength dear. Very soon, you will begin to reap the rewards.... maybe even before the 100 days are up. Hehehehe!I don't think I can participate in this fasting exercise,anytime am awake,na hunger,as in,its now serious unlike me that don't eat for hours. *hilarious*Really fasting isn't easy esp when u hve stomach ulcer.I will advice u to distract yourself by reading your bible n praying. D truth is u turned d 'fast' into 'hunger strike'.not good. I go through the same thing too. There will be so much food around during the fast, but, it will seem to disappear when its time to break. I will start counting days. Looking at calender, waiting for day 100 will get here on time. Prayer also makes the time go faster. Like you said it's for our good. What matters is that God sees our weakness and strengthens us. Truth be told, on those fasting days the clock ticks slowly. Lol read this and I just smiled cos this happened to me today ,I was actually vibrating before breaking my fast and cleared my plate of food . Yo beta fast weh weh!!! Oh sisi! I love your openness! LOL...Daddy Adeboye must see this! lmao! hope you pray before you break sha oo? lol, naso the hunger wire me on Saturday too but the Lord is our muscle, we must start and finish the fast.. I convinced myself i was ill and have to pop pills so i missed today!!! Just seeing the comment that says i have to make up with two days..... i should have just managed* this sickness for today. I cannot laff honestly.Am fasting till 3pm today,and prior to reading your post I have been checking my watch intermittently..Now it's 12.30,was considering breaking at 12.But v persevered.D devil is a liar!sigh! I just read this while at work and i couldn't help but comment. There is no one here to laugh with everyone one is busy with their work, but this is so oooo funny and describes me in many ways that i have given up fasting for now cause i feel i am just starving myself.